A wild and funny Southwestern Goldilocks. Way out West live three bears who like to keep their cabin neat and tidy. 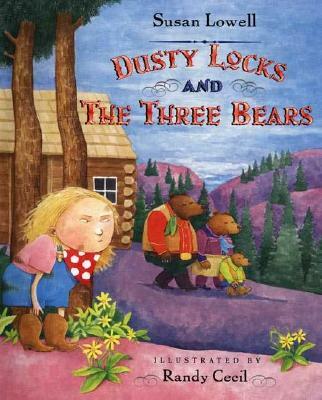 But one day while they're out for a walk, a dirty little girl named Dusty Locks barges in and helps herself to their supper of beans. The big bear's beans are so full of chile peppers that she burns her mouth. The middle bear's beans don't even have any salt. But the bear cub's beans are just right, so Dusty Locks gobbles them all up. When the bears come home to find their nice, neat house looking like it's been hit by a whirlwind, they get riled -- and Dusty Locks runs home so fast the dust doesn't settle for a week. The talented team that created Little Red Cowboy Hat works its hilarious magic again in this lively western retelling of Goldilocks. Susan Lowell comes from a long line of ranchers. She spends part of her time on a small ranch in the desert and the rest of her time in Tucson, Arizona. She is the author of several best-selling books for children, including "Little Red Cowboy Hat" and "The Three Little Javelinas." Randy Cecill is the illustrator of "Little Red Cowboy Hat," as well as "The Singing Chick" by Victoria Stenmark. He lives in Houston, Texas.